Like I said before, I really only planned on attending one day of festival activities, but ended up being there for all three days of Mothy fun. Since Carrie couldn't make it down on Saturday, I returned with her on Sunday, the third and final day of the festival. The main thing we wanted to accomplish on Sunday was attending the panel discussion of the event's speakers. Rosemary Guiley moderated the discussion with guest speakers Susan Sheppard of the Parkersburg Ghost Tours, researcher Joedy Cook, cryptozoologist Ken Gerhard, cryptozoologist Lyle Blackburn, UFO researcher Stan Gordon, and cryptid researcher Bill Brock. As with the individual talks, the panel discussion took place within the historic (and haunted!) State Theater and was really quite interesting. Rosemary got the ball rolling by asking some general questions of the speakers, and then the mic was opened up to the audience. Previously, Carrie and I had had an in-depth discussion about an issue in cryptozoology and had wanted to get the panel's take on it---but neither one of us could actually bring ourselves to standing up in front of everyone and asking our question. So, after the discussion was over, we followed the speakers back over to vendor's row. We browsed around a bit to take in all the cool art, t-shirts, books, and other paranormal/horror novelty themed merchandise for sale. We stopped by Jen's PlushyBoo booth and had a great conversation with her and her family. 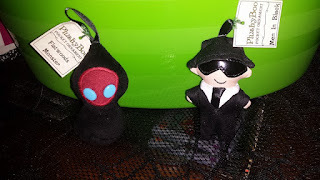 I was bummed that I missed my opportunity to pick up a plush Mothman (she had sold out) but she gave me a wonderful deal on a Braxton County Monster AND Man in Black plushy. Seriously, if you haven't checked out her work, go do so NOW. These little cuddly cryptids are so well made, so adorable, and just so freakin' awesome. They'd be great gifts for paranormal researchers and enthusiasts, look great on the shelf of any collector of curiosities, or serve as a unique toy for the kids in your life. Here's her Etsy and here's her Facebook page. After we talked with Jen, we continued to make our way through the vendor's area...and saw Ken Gerhard at his table. Carrie and I had both been impressed with Ken's answers and his personality at the panel discussion, and since he wasn't currently bombarded with fans at the time, we decided to go have a chat...and ask the question that had been plaguing us, lol. Our question basically was about why more witnesses didn't come forward describing Bigfoot's, uh...junk. After reading several works by Linda Godfry, it seemed like several other cryptids always had their gender visible...but with Bigfoot it never really was talked about all that much. Ken was obviously amused by our questions, but handled it like a true pro. Without making us feel too weird (we handled that all on our own) he gave some pretty good answers as to why more people aren't describing Bigfoot genitalia. And since I know you're DYING to know....basically, there are a few reasons why this phenomena is under reported. There actually have been several well documented cases of people having up-close encounters with Sasquatch creatures and they definitely reported being able to tell a difference between males and females, but generally, witnesses never get close enough to notice that detail because its not a very noticeable detail, lol. In general, primates are NOT well-endowed in relation to their body size, humans being the exception. So, in summary, people aren't reporting seeing Bigfoot junk because its too tiny to see from the distance which they are being observed. Can you find the igloo? After our little talk, we caught the tram tour through Pt. Pleasant and we were lucky to have Dennis Bellamy, the head guy of tourism in the city, as our guide. We learned a lot about the history of Pt. Pleasant, but a few items stuck out in particular to me. For starters, most locals still will not talk about or embrace the idea of the Mothman. After the Silver Bridge collapsed, it was like the issue was never discussed again and the Mothman mania that had gone on over the past year died down as the town mourned the loss of so many of its own. Secondly, the whole Chief Cornstalk curse thing---total fabrication. It came about as part of a play put on by the local elementary school in conjunction with the town in 1926. Still, I loved the tour, and it was a great value at only $3 a ticket. By then, though, we were getting a little tired. However, no trip to Pt. Pleasant is ever complete without a trip to the TNT area to check out the old igloos. At one point, there were only three igloos down one little road that I knew to be open. On this trip, however, we noticed a bunch of cars parked at ANOTHER side road, so we parked the car and walked down the path to find that two igloos that I had never been in before were open. 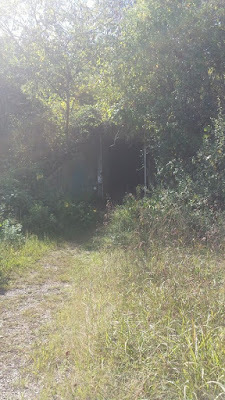 It's always a fun experience walking into those, hearing the strange acoustics, and imagining what it must have been like during the days of TNT manufacture in the area. It can definitely get a tad...spooky. So that wrapped up our day in Pt. Pleasant, and Mothman Festival weekend for me. This year, I tried to cram in several things that I normally don't do during the festival. Every year we go to the Mothman Museum, take a tour of the Lowe Hotel, and visit the River Museum. And, if its not too busy, we eat at Harris'. All of these are wonderfully fun things to do, and I recommend them to anyone coming to the festival or visiting the area throughout the year. This year, I just wanted to do things a little differently! There are only so many hours in a day, and the Mothman Festival is so packed full of awesome activities for everyone. I really have to congratulate Jeff Wamsley, Ashley Wamsley-Watts, and the many others who really come together to pull off such an awesome festival! As I alluded to above, there is literally so much to do that its nearly impossible to cram it all into one weekend. I also have to give the staff and guests major props---there really isn't anywhere else, and certainly no where around here, where you're going to find the caliber of speakers the Mothman Festival brings in...and for FREE! 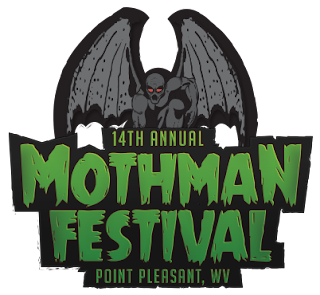 And, unlike many other conventions and festivals, the Mothman Festival allows an opportunity to really network with and get to know so many members of the paranormal community. If you haven't been, I highly recommend making the trip. Next year will be the festival's 15th anniversary and the 50th anniversary of the Mothman sightings, so it's sure to be big in 2016.